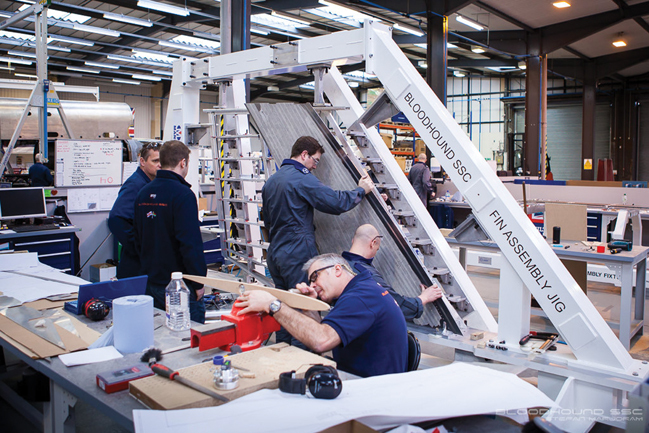 The construction of the Bloodhound SSC supersonic vehicle is nearing completion. Indeed, each subsequent visit to the Bloodhound Technical Centre, an anonymous industrial unit on the western edge of Bristol, has revealed a more and more complete-looking car. From the boxy shape of the lower chassis to the arrival of the insectile curved form of the carbon-fibre composite monocoque that will protect driver Andy Green during the car’s runs on the stony desert surface of Hakskeen Pan in South Africa’s Western Cape, to the long, arched stretch of the upper chassis, the solid reality of Bloodhound is steadily making the full-scale model of the show car, familiar from its visits to industrial exhibitions and schools around the country over the past few years, look more and more like the working sketch that it is. Everyone on the project is now aware that the clock is ticking. A big notice board by the entrance to the construction bay displays the project deadline: Bloodhound is to be finished by 25 July. “People have been here seven years now: that’s a long time to be working on this,” Elvin said. Assembling the upper chassis was a multi-stage process. 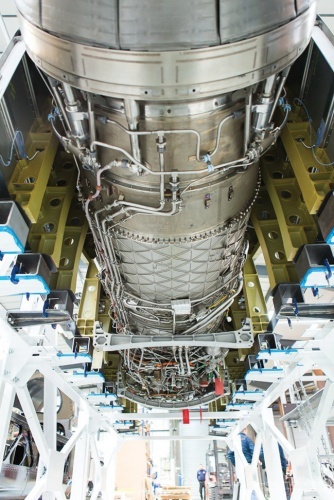 After the supporting ribs were produced, they were lined up on the lower chassis; then the car’s jet engine — a Rolls-Royce EJ200, the world’s most energy-dense turbojet and the power source for the Typhoon jet fighter — was drawn up into the space under the ribs to check clearances. “We know how much we expect the EJ will move, so we had to check we had that space before the skin went on. The titanium skin was then placed over the ribs, drilled and fixed, then bonded and autoclaved. The final step of emplacing dozens of pressure sensors under the skin was being completed during our visit, with spaghetti strands of PTFE tubing snaking from the sensors around the inner surface of the fuselage; they will carry the wiring from the sensors to the onboard interface block, where data will be collected during the car’s runs and from where the engineering team will download to plan the speed progression. them being blocked by desert dust. With the completion of the upper chassis, the focus of the engineering effort has now shifted somewhat from the main body of the car to some of its key components and subsystems. 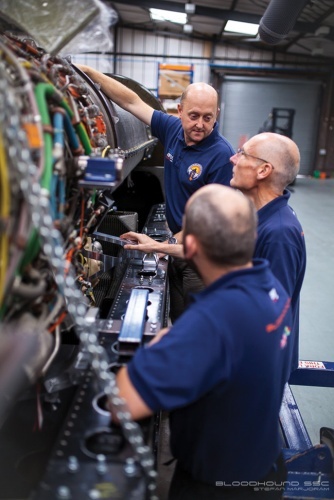 In another corner of the workshop, RAF engineers are piecing together Bloodhound’s tailfin, one of its most distinctive features and a magnet for members of the projects fan club, hundreds of whom have paid £10 each to have their names inscribed on it. Somewhat larger than the fin of the show car and cruciform, rather than T-shaped, with its aerodynamic winglets set half way up its height rather than at the top, the fin is very similar to that of BAE Systems’ Hawk jet trainer aircraft, familiar to most from its role in the Red Arrows display team. 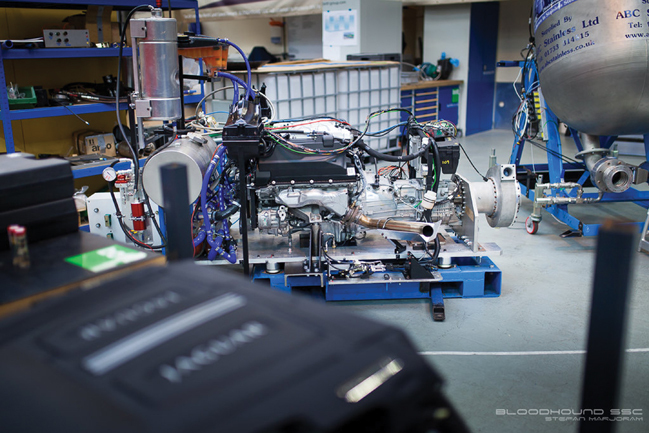 The team is also adjusting to a new auxiliary power unit (APU), the engine that drives the pump that supplies high-test peroxide to oxidise the solid fuel in Bloodhound’s rocket engines. During tests of the hybrid rocket system, it used a Cosworth 12-cylinder Formula One (F1) engine, but Cosworth withdrew from the project when it exited F1, so the new APU is a five-litre supercharged V8 engine supplied by Jaguar. This has an advantage over the Cosworth, Elvin said: “It has so much torque that we can go from 1,000rpm at start to 6,000rpm redline with no holes in the torque curve and no loss of performance. the rockets at the right moment,” Elvin said. Rather than running through a conventional gearbox, to save space and weight the engine is connected to the pump via a chain-drive, derived from those used in Land Rovers and Range Rovers in the transfer box for four-wheel-drive systems. This is a simple twin-sprocket system, with the chain running between two sprockets sized to give the appropriate step-down from engine to pump. The clutch system is also a special design, which uses hydraulic pressure to keep it closed; if Bloodhound’s hydraulic systems fail, for example from a stone flying up and severing the fluid line, the clutch will disengage the engine from the pump and the rocket will stop. Bloodhound is a very different shape from its predecessor, Thrust SSC, and Hakskeen Pan is different from the Black Rock Desert where Green last broke the Land Speed Record in 1987; from simulations, the team believes that Bloodhound’s shockwave will be less destructive than Thrust’s, which broke up the surface ahead of the car and forced the wheels to run through relatively soft material. Exactly, so why are you doing it? It’s a complete waste of money and engineering talent. Can’t they find something better to do AND create useful IPR in the process? If the Team had a sound understanding of chassis dynamics they wouldn’t have come up with this design anyway. Their engineering convention is compromised by its inherent instability. . . .
DS – I find this enterprise infinitely more compelling in promoting engineering excellence than building and then attempting to fly a completely useless solar powered aircraft across the Pacific ocean. Oh, and a Cosworth V12 engine that stalls at anything under 30,000 rpm… really? BLOODHOUND’s education programme is already the largest STEM outreach initiative in the UK, the network of ambassadors and animators engage with over 100,000 children each year. The programme is being rolled out globally with the aim of inspiring the widest possible audience to pursue careers in science, technology, engineering and mathematics. The IP generated by the Project is made freely available to both students and industry alike. The CFD study, for example, the most detailed model of supersonic airflow at ground level could be directly applied to the development of high speed trains as they approach transonic speeds. Once again, I (and I hope all fellow Engineers) can only marvel at the ability to create, manufacture, manage and operate the various processes necessary to bring this magnificent creation to fruition. Definitely effort at the very pinnacle of the application of science -ie Engineering! (ii) dementia (in the accused) is apparently a reason for the State NOT proceeding with criminal cases. Is it only we Engineers (and other teachers and technologists)-true professionals- who manipulate Nature’s Laws to the benefit of all mankind- who really make a contribution? The rest….? Reading about projects like Bloodhound and Solar Impulse 2 remind me of wide-eyed innocent childhood memories flicking through glossy pictures in the Guinness book of records. Dedication is what you need, cue Roy Castle trumpet solo. There are two things that excited me as a child; Thrust 2 and the Mazda 787b. They showed me that ideas and imagineering are the only thing that can overcome everything; nature, limits, fear and complacency. 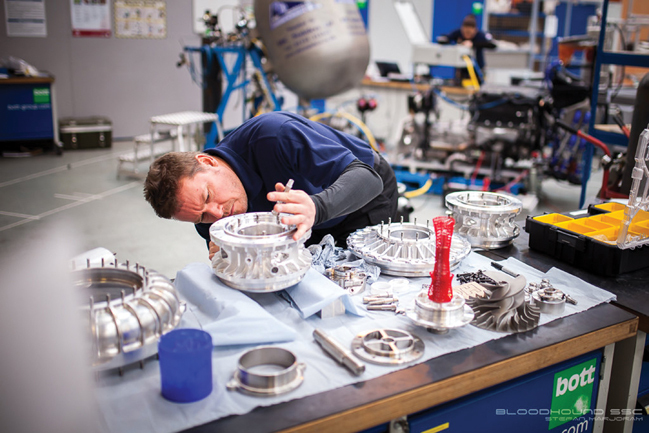 The team behind BloodHound are doing this for all of the right reasons; to inspire, engage, effect and enthuse. Outside of medicine I can see no cause more noble.